Curious about what goes into our top-of-the-line unit? It's more than just coils and controls. Check out the attention to detail Trane puts into every XV20i TruComfort™ Variable Speed unit we build. Now, let's break down the benefits. Variable speed isn't new technology for Trane. We created it, then perfected it. Trane was the first in the industry to apply variable speed technology to residential air conditioning and we've taken it the next level with our Climatuff™ Variable Speed Compressor. The Climatuff™ compressor knows exactly when to vary the operating speed as the outdoor temperature changes. It makes adjustments in as little as 1/10 of 1% increments to maintain within 1/2° of the thermostat setting. That kind of precision guarantees that it's never too hot or too cold in your home. Your system glides along on cruise control, barely sipping electricity. The XV20i is quieter than most air conditioners — thanks to an integrated fan system that runs 4 decibels below our competitor's minimum. The Compressor Sound Insulators also cut down on operating noise, so can feel the power of your unit without hearing it. The higher the system SEER rating, the more comfort you'll get from each energy dollar you spend. The XV20i has a 22-SEER rating, making it one of the industry's most efficient systems to help you reduce energy costs and usage. Upgrading to the XV20i is a great way to go green. ComfortLink™ II Wireless Communicating Technology connects your XV20i system components so they sync up for optimal performance and efficiency. Your system can optimize humidity and temperature in your home, as well as adjust compressor and fan speeds in real time to give you the most comfortable air operating efficiency possible. Trane TruComfort systems also work seamlessly with the Nexia™ smart home system so you can manage your home's heating and cooling remotely via any web-enabled smartphone, tablet or computer. Reliability and durability is a given with every Trane system. Our products are rigorously tortured and tested, so they'll hold up to anything. 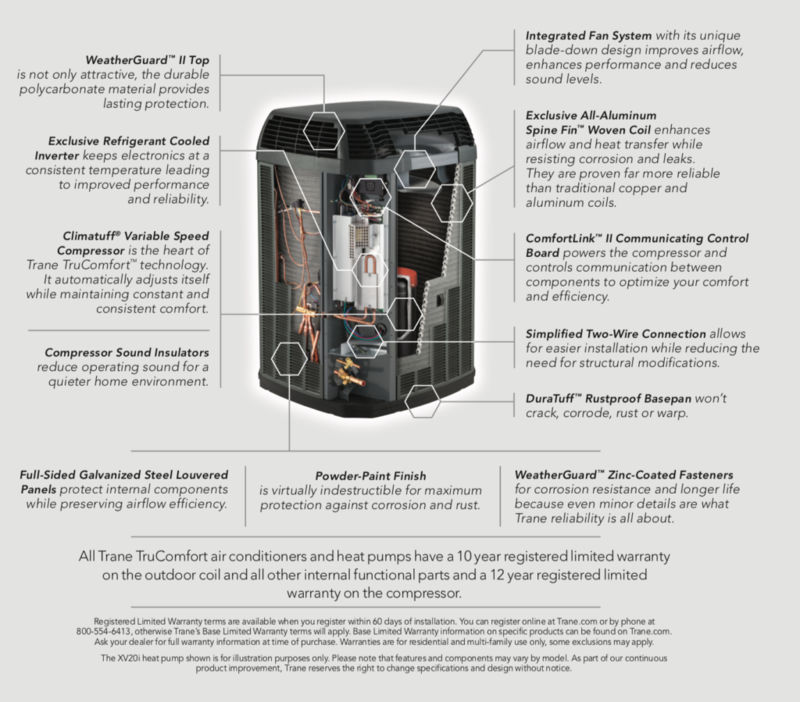 To top it off, all Trane TruComfort air conditioners come with a 10 year registered limited warranty on the outdoor coil and all other internal functional parts, plus a 12 year registered limited warranty on the compressor. Does the XV20i sound like a good fit for your home? Make an appointment with your local Trane Comfort Specialist to get more details and a pricing estimate.